"After an enormous popular demand..." one moment please to get me down from the clouds..., well, after receiving a few e-mails from readers and a quite recent conversation in Panoramic Photographers on G+ Community I prepared this Arca-Swiss® compatible Mini Lightweight Multi Row Panorama Head especially for the users of small footprint ILC (Interchangeable - Lens - Compact) digital mirrorless cameras. Since my engagement with the review of Sunwayfoto's really compact and incredibly lightweight DDH-02 and DDH-03 panning clamps, I was inspired to design something really small, yet with no compromises in sturdiness and versatility for this type of cameras. Therefore, I postponed once again the publication of my Heavy Duty MR Panorama head for a miniature one. The parts were all there, so all I had to do was put them together, check for the possible small camera configurations and go on with the presentation. Needless to mention once again that this is a fully Arca-Swiss® compatible panorama head with interchangeable and multi-usable components, following the pattern of all my designs, contemplating utmost versatility. For the role of horizontal rail, on which will sit all the upper structure of the panorama head, I have chosen the very sturdy Hejnar PHOTO G15-60 Multipurpose Rail. The length of 6" (152 mm) and the thickness of 5/8" (15,9 mm) are more than adequate for the purpose, especially the thickness is maybe an overkill. However, it is the smallest of the very sturdy 5/8" Hejnar line of rails with a large embedded bubble level and laser engraved decimal scales on the sides. Attributes that I find more convenient and appealing than saving a little weight with a shorter and/or thinner rail. Next for the role of a vertical rail I had chosen a 4" (101 mm) long by 1/2" (12,7 mm) thick rail the Hejnar G10-40 originally, which after the modifications agreed with Chris Hejnar it will be model G017-40. The difference lies on the extra front dowel pin holes (bottom-left photo) for proper alignment, as we shall see their usage further down. G017-40 has two captive slots, a center 1/4"-20 taped hole, a front 1/4"-20 taped hole and two 5 mm dowel pin holes. There are also two M3 safety stop screws at both ends at the bottom side (bottom-right photo), which however are of no importance since it is intended for vertical use. Laser engraved decimal scales run on both top edges. Hejnar G017-40 rail proved a sturdy rail capable of supporting more than an ILC camera, with no vibrations. Last but not least, for the role of a small and lightweight nodal slide, I have picked another 4" (101 mm) long by 3/8" (9,5 mm) thick rail from the Hejnar line. The A04-40 design is quite similar to the previous rail, but thinner, lacking also the front holes. Here, I could save a little weight and bulge since it is quite capable for the task without any torsional tendencies when used vertically. The release of the new Hejnar Photo E030-40 4" Nodal Slide Rail which was just previewed brings up a potential alternative to the Hejnar A04-40 rail proposed above. The dedicated nature of the Hejnar Photo E030-40 as a nodal slide, supersedes in functionality the solution of using a standard 4" x 3/8" Hejnar A04-40 rail. The 1/4"-20 tapped hole at the far end combined with the 5mm dowel pin holes surrounding it will offer better quick release clamp alignment and twist prevention. Plus a bubble level as a bonus. So optionally it may replace the A04-40 rail included in the SCV 4/3 Panorama Package without any extra charge. So far so good, but we need also two small clamps to complement the structure of this mini MR panorama head. Pictured above are two Hejnar PHOTO F60 1" (25,4 mm) clamps in top and bottom view, with the necessary hardware to be mounted on the Hejnar rails described above. You may seek for full specification of the clamps in the Hejnar PHOTO F60 1" Quick Release Clamp Review. The above photo was created, in order you can have an idea of what hardware, extras and tools are needed for the assembly of the mini MR panorama head. On the left 3 Allen hex keys intended for the Index bar soft tip screws, the M3 safety stop screws and the 1/4"-20 hex socket screws. In the middle, One 1/4"-20 captive 3/4" long screw, Two 1/4"-20 captive 1/2" long screws, One 1/4"-20 flat head screw, One 3/8"-16 > 1/4"-20 conversion bushing and one 5 mm dowel pin. (All hardware is made of stainless steel). And on the right Two Hejnar Photo Index Bars which I find very useful in marking positions or used as stoppers on the rails. As I have mentioned in the beginning of this article, Sunwayfoto DDH-02 compact Panning Clamp was the inspiration of this mini panoramic head. Its tiny size and light weight make it perfect for the role of a vertical panoramic rotator. Albeit its size it can also withstand the load for the role of horizontal panoramic rotator, in case you intend to mount it directly on a ball head in place of another clamp. The latter choice will save you some extra weight and money. Full details about the DDH-02 may be found in the Sunwayfoto DDH-02 compact Panning Clamp Review. On the other hand, for the role of a horizontal panoramic rotator there is the option of the more sturdy Sunwayfoto DDH-03 Panning Clamp, a little heavier though by 56 gr (1.97 oz), but nonetheless with some extra conveniences. As are its 360° panning scale and the included AM-02 Arca-Mount which allows it to be clamped quickly on any ball head equipped with an Arca-Swiss® compatible QR clamp. Full details about the DDH-03 may be found in the Sunwayfoto DDH-03 Panning Clamp Review. Note: The DDH-03 Panning Clamp will be used as a horizontal rotator for the illustration of the panoramic head. After the introduction of the components, let's go step by step in the assembly of our Mini MultiRow Panoramic head. The components needed for assembling the Vertical Rail are the Hejnar G017-40 Rail, one of the F60 QR clamps, the 1/4"-20 flat head screw, the 5mm dowel pin and the larger 4mm Allen hex key (top-left photo). After inserting the dowel pin in the front dowel-pin hole at the bottom of the F60 QR clamp (bottom-left photo), all we need to do is to fit and screw the clamp into the 1/4"-20 taped hole in the front end of the G017-40 rail. The dowel pin not only keeps the F60 clamp aligned but also increases the resistance of the Vertical Rail to lateral pressure. Needless to say that the clamp connecting screw should be tightened very well. Since the Sunwayfoto DDH-02 Panning Clamp has a threaded 3/8"-16 center hole, we need to install an extra 3/8"-16 > to 1/4"-20 conversion bushing (bottom-left photo) so as it can be mounted with an 1/4"-20 captive screw on the Vertical Rail. A very convenient and cheap tool, which I find very helpful for tightening a conversion bushing is the Friction Tool by Sunwayfoto pictured aside the DDH-02 Panning clamp (top photo) above. The bushing should not be longer than 8 mm in order not to protrude from the bottom of the panning clamp (bottom-right photo). This is the simplest case and you just need one of the 1/2" long 1/4"-20 captive screws and the 4mm Allen hex key as shown in the bottom-left photo, in order to attach the Sunwayfoto DDH-02 panning clamp equipped with the 3/8" > 1/4" bushing on the previously prepared Vertical Rail. Then the captive screw is passed in the rail slot as shown in the top photo and screwed tightly into the clamp busing (bottom-right photo). Our Vertical Rotator assembly is ready. However, this type of attachment requires attention when tightening the clamp on the rail so as the panning scale marks remain in the same position. The clamp base orientation and the precise positioning of the zero (0) mark is more troublesome as the clamp base can move freely. I should rather say "Optimally" but as there is extra cost involved I remain to the "Optionally". 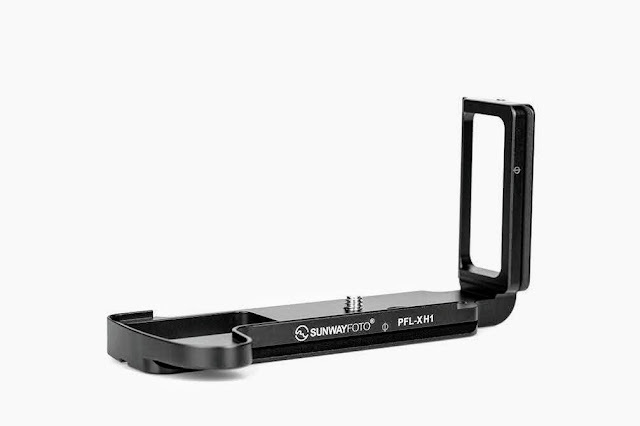 Sunwayfoto MPP-01 Mate Plate Adapter Review will introduce you to all the benefits of this plate. The most important though, are that it offers a quick alignment of the DDH-02 panning clamp in 90° increments and acts as an anti-twist mechanism which will not permit the clamp to loosen. In the bottom-left photo you may see all the components and tools required for the assembly via the MPP-01 mate plate. The previously prepared Vertical Rail, Sunwayfoto DDH-02 Panning clamp equipped with the 3/8" > 1/4" bushing, MPP-01 Mate Plate, the 4mm Allen hex key and the 3/4" long 1/4"-20 captive screw. We need the longer screw in this case to compensate for the MPP-01 4mm thickness added between the clamp and the rail. Then in top photo the captive screw is passed in the rail slot, the MPP-1 mate plate is aligned both in the DDH-02 clamp bottom grooves and in the G017-40 rail top slot. Just bring the parts together, screw the long captive screw into the bushing thread and tighten with the Allen hex key. As mentioned above, alignment is not critical, since MPP-01 guides the clamp in the correct position. It is up to the user to choose the orientation of the panning clamp base and the indications on the panning scale. However, the most appropriate position is to bring the zero (0) mark on the side so you may easily count - or + degrees from horizontal position afterwards. The components required for the assembly of our small and lightweight Nodal Rail are gathered together in the photo above. The Hejnar Photo A04-40 rail with one of the index marks, The largest Allen hex key for the 1/4"-20 captive screw and the smallest for the Index Bar soft-tip screws. One of the 1/2" long 1/4"-20 captive screws for mounting the Hejnar Photo F60 QR clamp and the Hejnar 3/8"-16 > 1/4"-20 stainless steel bushing with the Sunwayfoto Friction tool. First we need to screw and tighten the Hejnar 3/8"-16 > 1/4"-20 stainless steel bushing into the F60 QR clamp cente hole from above. Using the Sunwayfoto Friction tool proves very helpful. 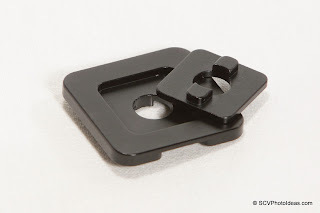 Note: Although the Hejnar Bushing is of high quality and fits perfectly on Hejnar QR clamps, unfortunately it does not fit well on the Sunwayfoto DDH-02 panning clamp therefore I cannot suggest its use with it. Next, one 1/2" long 1/4"-20 captive screw should be inserted in the A04-40 rail slot (bottom left photo), preferably the one that the decimal scale numbering starts. So afterwards the clamp center will coincide with the zero (0) point on the scale. The clamp is then screwed on the rail edge and tightened with the 4mm aAlen hex key very tightly. The use of a stainless steel bushing permits a little extra force to be applied since there is no anti-twist mechanism between the F60 clamp and the A04-40 rail. Even with no anti-twist mechanism there was no instance of twisting in all the test even when deliberately forced to. The clamp may be oriented in 90° increments at the end of the rail depending on the orientation of the camera QR plate you have. In this article I shall be using the clamp with its jaws in parallel with the rail longitudinal axis and the screw knob on the left side (top photo) but it can be set with its jaws perpendicular to the rail axis and the knob facing backwards (bottom-right photo). In the latter case, best position is to set the clamp center exactly on the decimal scale zero (0) mark as shown above. Somehow, depending on the length of your lens and its corresponding entrance pupil (nodal point) there is a chance that the total length of the nodal rail be too much, depriving the camera from turning in a vertical position. In this case the clamp should be remounted a little forward inside the rail. If you choose the Hejnar Photo E030-40 4" Nodal Slide as updated in the rail choices in the beginning of the article there is a slight change in the assembly process. Actually there is no need for a 3/8"-16 > 1/4"-20 bushing to be installed on the F60 QR clamp, since it will be mounted from top into the tapped hole of the rail. In this case all we need is to use one dowel pin in the appropriate hole according to the desired clamp orientation (bottom left), one 1/4"-20 flat head screw which will be provided, the F60 clamp and the the appropriate 4mm Allen hex key. The QR clamp can be aligned and fixed securely at the back end of the small nodal slide. Considering that both Sunwayfot DDH-02 and DDH-03 panning clamps, feature a very compact size and light weight, (even lower than similar sized simple QR clamps); it is obvious that they were designed to replace an existing clamp, being mounted directly on top of a ball head. So for those who intend to use their gear for making panoramas often, this is the optimal solution. With a diameter of 5,2 cm and a weight of only 74 gr, DDH-02 is ideal for even a small foot print ball head like the Sunwayfoto DB-36TR Traveler Ball Head pictured above on the Triopo GT-3228X8C Traveler Tripod. Instructions about mounting DDH-02 on a ball head may be found in the Sunwayfoto DDH-02 compact Panning Clamp Review. Instructions on mounting DDH-03 on a ball head may be found in the Sunwayfoto DDH-03 Panning Clamp Review. The AM-02 Arca Mount is a solution for those who need to use the DDH-03 panning clamp and in extension the Panorama head occasionally or are not able to attach the panoramic clamp on their ball head due to thread or design incompatibilities. Unlike DDH-02, the DDH-03 comes with a dedicated Arca-Swiss® compatible mounting plate by default. However, for those that intend to use the DDH-03 mounted on a ball head permanently, it is also sold without the AM-02 plate as model DDH-03N at a lower price. 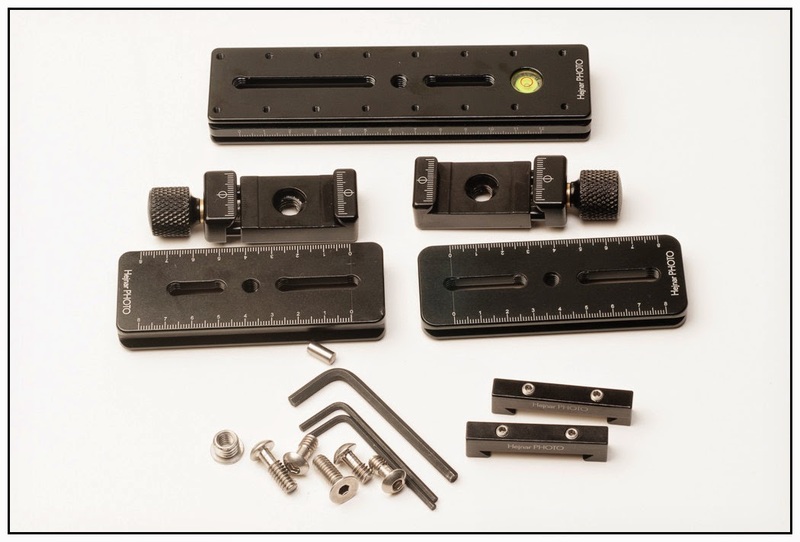 For a thorough AM-02 Arca Mount orientation and installation instructions you may refer to the Sunwayfoto DDH-03 Panning Clamp Review. When equipped with the AM-02 plate, DDH-03 can sit on any ball head equipped with an Arca-Swiss® compatible Quick Release clamp, using the ball head below as a convenient leveling device. Since the vertical rail is mobile, it may undertake the role of camera position regulator, therefore the horizontal rail may be clamped on the horizontal rotator clamp and fixed on a standard point of its scale for future reference. The Index Bar, in this case, may be positioned at the outer edge of the horizontal rail and should be tightened fully after the camera position is defined. Next the Hejnar PHOTO G15-60 rail used as a horizontal support rail should be inserted from top (due to the existence of safety stop screws at the bottom) in the Sunwayfoto DDH-03 panning clamp jaws and tightened in place. Then it should be equipped with one of the Hejnar Photo Index Bars as an index / stopper for the vertical rail. It's the turn of the vertical rail, equipped with the Hejnar F60 QR clamp at the bottom, to be placed on the horizontal rail. The final position of the vertical rail will be defined later on, after the camera / lens alignment on the Panorama Head. In order to complete the structure of our Mini Panorama Head, the Nodal Rail prepared earlier should be inserted and secured in the vertically mounted DDH-02 Panning clamp and in accordance to the predetermined Entrance Pupil (Nodal Point) position marked with the Index Bar. That is, the Index Bar should be aligned with the middle (point zero) on the clamp jaws. Read further down about the determination of the Entrance Pupil. ...and tightened securely by using the small teardrop shaped lever knob. Now our Mini MR Panoram Head is ready to accept our camera and take action. Total weight of rail structure plus both DDH-02 and DDH-03 panning clamps reaches 0.6 kg (1.32 lb). If 2 x DDH-02 panning clamps are used instead, you may have another 56 gr (1.97 oz) gain. Just for comparison, the full scale Multi Row Panorama Head Ver. II on the left versus it's little sibling Mini Multirow Panorama Head on the right. A Total weigh of 1,204 kg (2.65 lbs) versus a total weight of 0,6 Kg (1.32 lb). Almost half the size but exactly half the weight !!! For the illustration of this Mini MR Panorama Head, I have chosen Sony's alpha NEX-C3 ILC mirrorless camera, as a nice example of this small size cameras, which also sports a nice 18-55 mm zoom lens. The camera/lens combination weighs a total of 485 gr (~1 lb). First of all the camera has to be equipped with an Arca-Swiss® compatible quick release plate in order to fit in the scenario. Coming handy after a recent review, Sunwayfoto DP-26 Universal QR Plate is shown fitted on the Sony NEX-C3. The QR plate size complies well to the whole mini and lightweight concept. You may seek more information on the QR plate in its review. Luckily enough, the tripod mounting socket at the bottom of the NEX-C3 is in axis with the lens center, so there is no need for any alignment of the QR plate. There is a lot written and said about the determination of the Entrance Pupil (faultily called Nodal Point) of a lens, the knowledge of which I took as granted when writing my previous articles about my Panorama Heads. Considering the fact that there is not much information available about ILC camera lenses and maybe some ILC camera users may be novices in panorama photography, I decided to open a parenthesis here and write a few paragraphs more about Entrance Pupil determination in direct relation to this Mini MR Panorama head, for reference purposes. I do hope I will find the time to write a full detailed and well documented article dedicated on the matter in the future. As more or less known, by determining the entrance pupil position of our lens helps us to avoid the Parallax phenomenon appearing in our images when shooting panoramas, that would in turn produce stitching errors. As the parallax phenomenon is more evident between close and distant objects, the simplest method to find the Entrance Pupil of a lens is to use two vertical lines within the field of view for reference. One should be located near the camera and the other farther away. For example, indoors you can use a second (leveled) tripod with the center column extended or a light stand pole, set near the camera at about 1m (3') and a door vertical frame that is farther behind. Or two light stand poles set one close and one far away. Outdoors you can use two consequent street light poles, or a street light and a building side. In order to simplify the process you may use only the horizontal Rotator and the Nodal Rail to determine the entrance pupil position. Place the prepared Nodal Rail in the DDH-03 panning clamp.which is already installed and leveled on a tripod head..
...and mount the camera on the Nodal Rail. Then the dance begins... left, right, back, left, right forth, and so on... :-) I'm joking of course, but if you listen to some music while determining the Entrance Pupil will certainly be a pleasure. As long as you pivot your camera left-right and there is a displacement of the apparent position of the two preset vertical lines or simply put if you see that the two vertical lines seem to come closer together or get farther apart as you turn the camera then a Parallax error still exists. Move / slide a little the camera backward from the pivoting point if the distance between the vertical lines seems to increase, or forward if it seems to decrease. When there is no displacement of the apparent position of the vertical lines, i.e. even if you pivot the camera left - right the preset vertical lines remain at same distance between them then you've reached the non Parallax point / Entrance Pupil of the lens. Next you need to mark the point on the Nodal Rail decimal scale that coincides with the DDH-03 clamp zero (0) mark as indicated by the wide arrow in the top photo, for future reference. Insert the second Index Bar on the top dovetail of the Nodal Rail and place it exactly at the point (bottom-right photo). Tighten both the soft tip screws with the smallest Allen hex key (bottom-left photo) to secure the Index bar. Remove the camera and Nodal Rail and you are ready to assemble the mini MR Panorama head. Note: In case of a zoom lens the Entrance Pupil position should be determined for each focal length that is meant to be used for shooting panoramas. Next step is to attach our camera on the Nodal Slide QR clamp via its Arca-Swiss® compatible base plate. As there are no safety stop screws in these small camera QR plates, in my opinion, the safest position for mounting the camera on the Mini Panorama Head is with the Nodal Rail turned down. Slide in the camera QR plate into the Nodal Rail clamp and tighten the clamp firmly. Since the camera in this illustration is equipped with a QR plate with its dovetail installed perpendicularly to the camera base, plus the fact that it is centered with the lens middle axis, things are quite easy. All we need to take care, is that the QR plate is correctly aligned and clamped on the Nodal Rail clamp. However, in case your camera is equipped with a QR plate with its dovetail in parallel with the camera bottom, then things become a little more complicated. Thus the Nodal rail clamp should have also been attached in a different orientation with the screw knob facing outwards as described in the Nodal Rail assembly process, in order to permit bi-lateral movement of the camera. Then, the camera should be aligned within the clamp so the lens central axis is exactly above the Nodal Slide middle axis, which in extension will coincide with the pivoting axis of the vertical panning rotator. In my opinion, all adjustments and index markings, should be performed at home once for every camera/lens combination and for every focal length to be used . Then when on location you only need to set up your tripod, reassemble the panoramic head at pre-marked points, mount your camera and level your gear. Then you may start shooting your panoramas as planned, right away without any waste of time. It is supposed that the entrance pupil point (Nodal point) of the lens to be used is already determined and marked with an Index Bar on the Nodal Slide Rail. Once on the spot and in order to proceed into the next step we must ensure that the nodal rail is aligned with point zero (0) on the DDH-02 panning clamp jaws or in other words is set exactly on the rotational axis of the vertical rotator. The DH-02 panning clamp screw knob should be tightened well in order to avoid the nodal rail from slipping. Due to the tight situation with small gear involved, the panning clamp should be rotated a little, either forward as pictured above or backwards in order to have a good grip of the screw knob. Sony NEX-C3 ILC mirrorless camera clamped on the Mini Panorama Head and centered above the horizontal rotation axis. The panorama head is leveled by the Sunwayfoto DB-36TRLR Traveler Ball Head and supported by the Triopo GT-3228X8C Traveler Tripod. As mentioned previously the horizontal rail may remain fixed in a standard position on the horizontal rotator clamp, then any adjustment of the camera positioning may be done by releasing a little the vertical rail bottom clamp and sliding it to the desired position. Our goal is to bring the lens center exactly above the rotational axis of the Panorama clamp. Then we may tighten the Index Bar on the horizontal rail via its two screws, in a position behind the vertical rail thus becoming both a safety stopper and an index mark for future use. Taking as an example the forementioned Sony alpha NEX-C3 ILC camera with the kit 18-55mm OSS lens set at its widest 18mm focal length, then it would require a minimum set of 32 shots to complete a full 360° spherical panorama. This interprets into a Nadir shot, 3 rows of 10 shots each and a Zenith shot. If it is difficult for you to determine the 36° intervals, or if you want more overlapping between your images for better stitching then you may shoot 12 shots every 30° for each row. This process will require a total of 38 shots to complete a full 360° spherical panorama. 10-12 images shot at 0° pitch (horizontal). The proposed rail sizes for this mini MR Panoramic Head, will permit a compact sized ILC camera equipped with a short telephoto lens (as the Sony NEX-C3 / 18-55mm pictured in the illustrations) to rotate a full 360 degree circle vertically. The camera turned vertically with obviously ample space bellow, in order to shoot a Zenith. The removable vertical bracket introduced with the Multi Row Panorama Head Ver. II, not only permits easier handling for storage and transport but its mobility adds also an extra feature not possible with a fixed L bracket. Shooting a Nadir becomes more efficient and requires less post processing. Instead of just turning the camera in a vertical position facing the ground the vertical rail can slide to the other edge of the horizontal rail, sitting on top of the horizontal rotator. In this way a Nadir may be shot with less obstruction from the Panorama head structure and the tripod leg hub (spider) and legs. Besides functionality, stability, weight... One of the main goals of my designs is versatility. It is well known by now that I'm very fond of modular designs. Modular designs, have the benefit of being able to use all parts in multiple applications and another less obvious to pack the gear easily and safely. Due to the modular design the Panorama head may be dismantled and rearranged in such a way in order to fit is a pouch for transport or storage. My choice is the Matin Neoprene L size pouch with internal dimensions 170 x 95 mm. The Matin pouch is ridiculously cheep with very good quality. Drawstring closing with anti-stretch top, belt loop and a hook. The Panorama head components may be stacked and clamped on top one another avoiding any scratches during transport. The horizontal rail may be clamped on the nodal rail clamp, which is already clamped on the vertical panning clamp. ... and close it via the draw string. If you can't fit it in your carry bag or backpack, you can hang it outside or on your belt. More on larger Panorama Head structures and operation instructions, you may find in the "Relevant Articles" section below. A. Some of the rails, like the Hejnar G15-60 and A4-40 rails captured in some of the illustrations in this article are prototype or first production units, as I received them early for testing, therefore there may be some small visual or functional differences* between them and the units currently in production. The final products are illustrated in the rail choice introduction in the beginning of the article. (*as decimal scales or front holes missing in some photos). B. The slimline Sony NEX-C3 mirrorless camera illustrated in this review "modeled" by courtesy of All About Digital Photo photography stores. C. Check the Recommended Sellers page for a valid Hejnar Photo discount coupon for purchases at the Hejnar Photo Store, and for the OEC Camera discount policy for multiple purchases at the OEC Camera Store in Amazon.com. Since there are a lot of individual Hejnar PHOTO parts involved, I have contacted the manufacturers in this regard, who were once again very wiling to help by forming a package according to my recipe including all necessary parts: rails, clamps, screws and tools. So if anyone of the readers would like to build my version of a mini multirow panoramic head can simply order the package without minding about details. Needless to mention that the package besides convenience has the extra benefit of being priced lower than the sum of the values of the individual items by 10% (minus an extra 5% using the discount coupon). Following the release of the Hejnar Photo E030-40 4" nodal slide the package may be ordered with it instead of the originally proposed A04-40 4" rail. Trying to achieve an utmost gain for my readers, I have also contacted OEC Camera about forming a package including all necessary parts. In this case things were a little more difficult due to the fact that my solution offers different rotator choices and mounting options. As soon as I have an answer I shall post an update accordingly. Nevertheless any item can be ordered individually in the mean time. 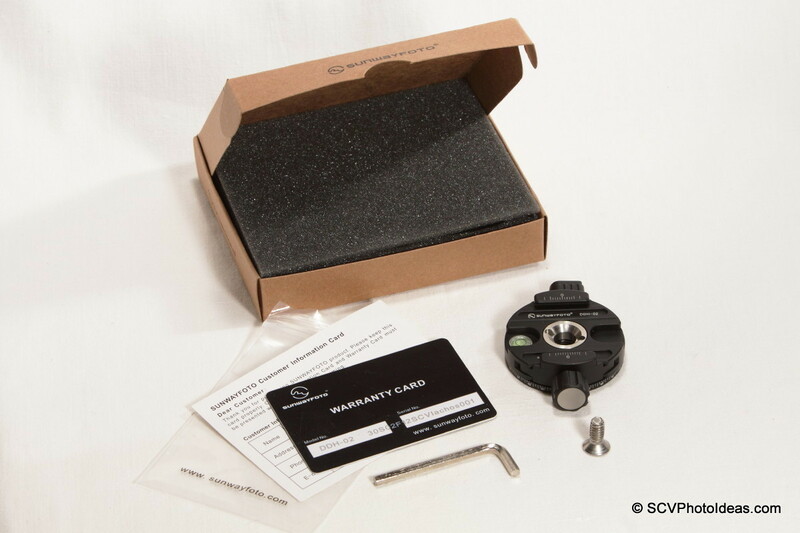 They obliged, by offering a kit which includes Sunwayfoto DDH-02 panoramic clamp DDH-03 panoramic clamp (w/ AM-02 Arca Mount), MPP-01 Mate Plate and Friction Tool and all necessary parts & tools for their assembly. All at a price 17% lower than the sum of the values of the individual items. (The above prices are calculated before any discount coupons and/or shipping charges if & where applicable). The Sunwayfoto Panning Clamps kit from OEC Camera is no longer available due to the discontinuation of the DDH-02 and DDH-03 panning clamps. As soon as a new kit will be available with the improved DDH-02i and DDH-03i paning clamps (preview) I shall update accordingly. According to increasing demand Hejnar Photo has released the G017-50 5" Multipurpose Rail as a longer (taller) alternative to the G017-40 4" rail used as a vertical rail. Current price for the Sunwayfoto DDH-02i, DDH-03Ni or DDH-03i Panning Clamps is US$ 79.00, US$ 89.00 or US$ 99.00 respectively with free shipping in the US, all avaialble from Amazon.com. And instead of the ball head you could use a tripod with a levelling coloumn. Absolutely right, for a pro solution, but at what cost, bulk and weight? I would remind you that, primary concerns for this idea were to be a compact, lightweight and affordable pano head for compact cameras and yet Arca-Swiss compatible. If you have the time check my other articles/reviews and proposals for indexed panoramic rotators and leveling bases under the Panorama tag. Wouldn't this do the trick? Excuse my ignorance in advance, I've been looking around at L plates, pano heads, etc and just came across your series of articles... They've been quite illuminating. It's very unfortunate that Sunwayfoto had to pull their panning clamps from the US market as I'm very satisfied with other accessories I've bought from them (and Sunwaymam flashlights too). In addition to tracking down some affordable panning clamps in place of the Sunways I'm trying to simplify the mini m4/3 setup for single row pano use; though I'm unsure if the cost difference will be worthwhile when taking into account Hejnar's package discount. 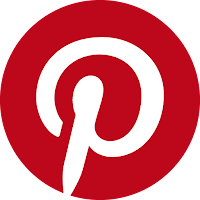 Thanks for your comments, being glad that you find the blog content interesting. Although the panning clamp you linked is an obvious Sunwayfoto clone, nevertheless it would do the trick. Even better considering its 15° click stop option. However, I cannot recommend it unless I get one for review and test its efficiency and strength both as a horizontal and vertical rotator. Unfortunately, Sunwayfoto had to withdraw their panning clamps from the US market due to excessive cost of entering in a court dispute. Especially DDH-04, 05, 06 and IRC-64 panning clamps are totally different in design than RRS with only common the "Panning Clamp" concept, but that's life. For a single row panorama, you only need a panning clamp and a nodal slide, not the full multi row pano-head structure. In this respect I would urge you to have a look at something different, reading three of my other articles starting with Create an Economy Leveled Panoramic Rotator via a Ball Head Flip-Kit which might save you a lot. Well, yeah, but then I'd need an L plate for portrait use... Still debating this, the L plate could be much cheaper or just as expensive depending on which I opt for, but it wouldn't be universal and it'd be extra bulk the rest of the time. OTOH the L plate would be useable with mini tripods etc... I might end up with both, the Quick Connect Hejnar package and a cheaper L plate for my E-M5 II, or the RRS L plate which I like much better (better design for grip attachment) and just a nodal rail, anyway! The real reason I'm replying again is to thank you for pointing that out, it clarified my choices a bit, and to let you know that the Sunway pano clamps (DDH-04/5 & 3i anyway) are still mysteriously available from Adorama even tho they were pulled from Amazon, B&H, and even eBay to an extent. I just realized that now, otherwise I would've opted for it over the Neewer... I'll stick with the latter for now since it does have the convenient (and adjustable) indexing detents, and I'm only using it horizontally and with lightweight mirrorless gear. Can't seem to get my Google sign in to work here, just says Unknown (Google), odd. Of course I would consider, if you'd be more specific commenting eponymously and suggesting an existing RRS vertical rail 112mm(4,4") tall, weighing 110 gr (3,8oz)and costing less than $85. Then I would know who to thank for. Besides the cost, what would the disadvantage of the RRS vertical rail vis-a-vis your proposal solution. I am sincerely seeking your learned opinion. A little uneasy with you reply! Any anonymous comment, attempting comparison with a vague (non specified) product with only leverage the brand name of an established and respected manufacturer and containing arbitrary statements like "...rather than relatively not so nice looking and I supposed heavier one you suggested" cannot be considered as seeking a learned opinion but rather misleading and of other intentions. In my previews reply I quoted the exact specifications of the proposed in the article SCV/Hejnar vertical rail. Besides the small dimensions, low mass and price, the proposed vertical rail has a modular structure that enables the potential user to replace the proposed rail with a longer one (e.g. 5" instead of 4") that would better fit his/her equipment dimensions. Another attribute of the proposed vertical rail is its universal character which permits the attachment of vertical rotators (panning clamps) from different manufacturers. I believe that above information will allow anyone to make his/her own comparison with any vertical rail he/she wishes. Thank you for this Sotiris. Very interesting as I have been looking for a very light weight and compact multi-row pano head package for mirrorless (NEX and Fujifilm X series) cameras. My application will be landscape, using the pano head and stitching to allow for greater enlargements in print. Are you aware of any of the pano head manafacturers specifically targeting mirrorless cameras and coming up with a lightweight, compact system as you have here? I've checked the RRS website but do not see anything. Nor do I see anything specific to the mirrorless camera platoform on Nodal Ninja. Your proposal here at 600-650 grams seems very lightweight and compact, although I do wonder if one could not get away with something even smaller and lighter. The weights of most mirrorless camera bodies themselves are on the order of 300 g.
I had made some compromises regarding weight, when designing my solution presented in this article, in lieu of utmost stability, sturdiness and lack of vibrations. These qualities prove of value when mirrorless cameras combined with telephoto lenses are used for HDR / Gigapixel photos. Although not specified for mirrorless cameras, there are small, even lighter pano heads in the market like NN 3MkII, NN Ultimate Mini and Bushman Gobi, but neither one is completely modular, nor Arca compatible, to name a couple of attributes that led me into designing my proposal. You may consider how much they comply to your needs and decide accordingly. However, I am preparing a preview of a simplified and very lightweight quick-connect pano head for mirrorless cameras which might also interest you. I hope it will be out soon enough to help in your decision making. Thanks Sotiris, I'd be very interested to read what you have to say about the simplified and even lighter weight pano head. The quick connect aspect would be of particular interest to me as I would still foresee taking many photos hand held as single images and only setting up for a multi-row pano when I saw am image I thought would be interesting enough for a large print. Thanks Dave for your patience. Just published a Preview of the Quick Connect Panorama Set for APS-C and 4/3 Mirrorless Cameras from Hejnar Photo. I hope it helps. Thank you Sotiris for this. I found your blog when investigating possible solution for my setup. I would also suggest a possible small setup ( for mirrorless system or compact ) with using the Jusino's PF-52 panorama clamp. I got a loan from my friend trying out to use the tripod head base + a cheap macro rail + a Benro L bracket to create the single row panorama. Thank you too Kuen for your suggestions. I did a little search about the Jusino PF-52, which is quite inexpensive and small. However, at first looks it's not very light, while it lacks a 0-360° panoramic scale. I cannot comment further, or recommend it unless I test it first. Unfortunately, I found it only selling in Malaysia which is actually a drawback for recommendation. I'll see if I can come in contact with the Jusino factory directly, though. It is a bit strange that only available here ( I am from Malaysia ). I ended up with starting a Single Row setup with using the sunway DDH-02 ( I ordered the DDH-03 to find out they don't have stock and downgraded to DDH-02, which I am a bit regret doing so ). I tried to fit the DDH-02 directly on a Sirui G20 ball head replacing the original Clamp but it doesn't fit well. Screwing too tight will yield friction on the rotational and too loose will resulting in an insecure mounting. My current solution is mounting the DDH-02 on my old Manfrotto 141RC2 3 way Pan n Tilt via the quick release plate. I am still trying to figure out where to go next to complete a multi row setup. Although I have not tested Sirui G20, I don't understand why tightening the DDH-02 on it induces friction to the rotator. Any screw passing through the stainless steel center which is connected with the DDH-02 bottom platform cannot interfere with the rotating part. They are independent. For a multi row setup you need another rotator. You can keep DDH-02 for vertical and possibly get a DDH-03 for horizontal rotator. You will also need vertical and horozontal rails. You cannot use Benro MPU105 for this purpose. Check also the article Quick Connect Panorama Set for APS-C and 4/3 Mirrorless Cameras from Hejnar Photo for a simpler solution. Great job putting together all the necessary pieces! I have built one from your plans and am testing with very good results. My only issue is that the rotators have numbers every 15 degrees, with six marks in between. That means each mark is 2.5 degrees, which is awkward. It would have been nicer if they had made numbers every 10 degrees, with five marks in between. Other than that, no complaints! Thanks Mark for the comment. In regard of the marks on the proposed rotators panning scale, the 2.5° increment is a common practice between rotator manufacturers. It started out with 5° increments on early implementations while the 2.5° scale was later adopted by RRS, Benro, NN, and Sunway lately. Your suggestion about numbers every 10° and five marks in between would give 1.6° increments. I suppose you meant four marks in between for 2° increments. However, the latter is only adopted by NN on their AD8-II Advance Rotator intended for Gigapixel Panos with long telephoto lenses.